Where am I?! Er, not too sure... We get to drive a Caterham 7. Adrian and I set off on a chilly but very bright morning. I never cease to be amazed at how the weather always seems to sort itself out for our occasions here. I had plumbed the destination into my ancient TomTom which got us there nicely in time for a 9:30am arrival. Inside the showroom were some fabulous-looking new cars in lovely colours. Outside was one rather odd-looking version in a strange shade of purple. Or brown, or pine-yellow, depending on how the sun caught it. Still, who cares? It was a little sports car and looked cool. Well, cold, actually. For the 'Prisoner' car album I changed it to a shade of green anyway! Once we'd had our papers checked, copied and filed it was time to learn what the knobs did, what sort of fuel to put in and all that sort of stuff. That didn't take long and I don't think either of us paid that much attention anyway. I got to drive first - the embarrassing bit when the regular staff look on as day trippers like us do kangaroo starts or generally make idiots of themselves. I managed to avoid stalling, at least. There was absolutely no spare room anywhere in this car so Adrian was clutching the Tom Tom in his lap. I hadn't worked out a route back. 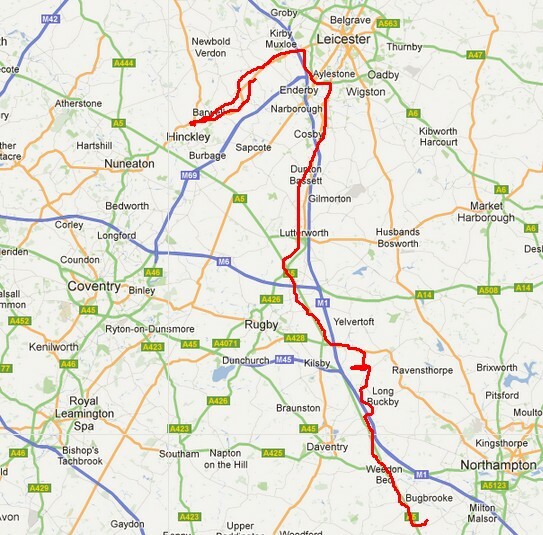 I thought we could probably find the A5, which shouldn't have been far away, and rumble on down that all the way home. 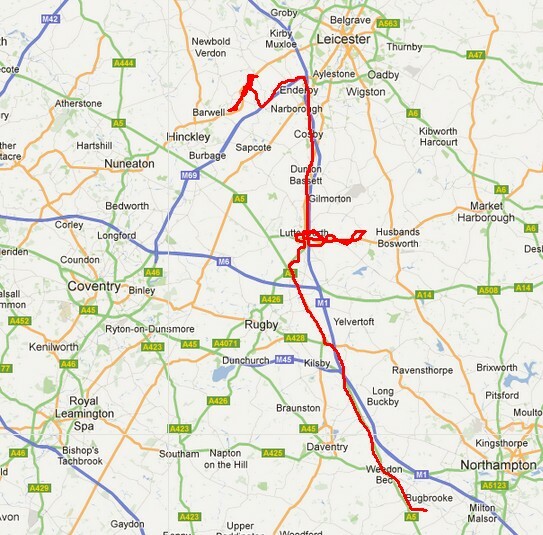 We certainly needed to avoid the M69 and M1 route but, of course, that's what TomTom expected us to take. We started off heading West out of the entrance instead of East which was the way to Leicester and the way we'd come in via the motorways. I was convinced that going the other way would bring us to the A5 eventually. Adrian was battling with the wind, my driving and the TomTom which I'd reset to avoid the motorway but which was still difficult to read without glasses and impossible to hear above the roar of the exhaust and other things. After a while, though, Adrian reckoned that signs to Nuneaton weren't really what we wanted so we turned around and headed back to Leicester. Unknown to us, we were actually just a few miles from the A5! I was dreading anything like roundabouts and traffic lights - indeed anything requiring me to stop as the brakes weren't exactly reassuring and battling with traffic on multi-lane ring roads when you haven't a clue where you're going was worrying, probably more for my passenger than me. I had had the chnace to get a bit of practice at roundabouts and take-offs, though, so the earlier diversion may actually have proven life-saving, or certainly no claims bonus-saving. Finally we're heading towards the A5 and pick it up again. We could relax for a while. Adrian needed a pee. That figured. We spotted a Services sign and pulled in. The 'services' were none too obvious, though and after a couple of circuits we concluded that the fuel part was completely dead. I parked up and Adrian went off to relieve himself somewhere. The car had plastic side window panels that opened diagonally up to allow exit. The rear view mirrors appeared to be stuck on these. I was looking at the one on my side and wishing it wasn't there as it made the inside quite narrow, you couldn't rest your right arm on anything and the clear plastic was about as clear as a dirty goldfish bowl would be. It looked as if it ought to just lift off. It did. Great. We removed both and stuffed them into the tiny boot. Back on the road, I'm still driving but beginning to quite enjoy the blast, especially now that there was no figuring out of lanes to do. The little car had amazing acceleration but above 50 with the side panels now missing, the wind was really blowing us around. Once we got to familiar territory in Weedon, Adrian took the wheel for the last few miles to his house where he thought Sarah might like to go for a spin or, at least chuckle at the two of us up to yet another crazy something. I realised just how rough it must have been for him. I had had an exhaust pipe running along my side which (a) warmed the air a bit and (b) diverted the wind somewhat. On the other side there was just the straight side and you got the full cold blast of whatever mph was on offer. That was quite chilly and I was glad to have taken a scarf. Photos at the Pinckard Emporium taken we finally arrived in the village and launched ourselves noisily up the drive and into the paddock. Now, there I had expected a big welcome committee and offers of sausage rolls, sandwiches and a cup of steaming hot something to warm the old cockles and all stations south. There was no-one around. We parked somewhere in the middle of the field and managed to extract ourselves from the cockpit. A few minutes later, as if awoken by the exhaust, people roll up and, more importantly, food and drink roll up too. Of course, the first thing all the men do is to take the thing to bits. Once they'd put it back together again we got lots of photos taken, Richard doing his usual excellent job of getting my best side and not shaking the camera one iota. Kirri and Matti arrive and crawl all over it. I quite wanted Kirri to have a go at driving but it was a bit risky as there is no telling what the throttle is going to do until it's done it and by then you can be half-way towards a bunch of cows and the brakes being what they are, the other half of that way can disappear all too rapidly. Instead I took him for a long spin around the lanes and frightened the life out of several rabbits. That worked well and so I took a number of others out on a variation of the tour, making sure to accelerate as damn fast as I could whenever the opportunity arose. One lady seriously looked like falling out at one point and I suspect that most will have secretly vowed never to get in a car with me ever again. One may not even have done the vowing particularly secretly. We did have a great time, though, and the weather was wonderful. God knows what it would ahve been like had it been raining or just a couple of degrees colder. In order to get back before the place closed at 3:30 we reckoned we should leave by 2pm. The chap at the Caterham Centre had actually asked if we could get back by 3pm which was really just so he could get home early and we didn't pay too much attention to that but we did have 3:15pm as a vague target time which a 2pm departure should more or less match. I finished the last guest run at 2:25pm. Hmm. We'd better dash. And dash we did. Adrian had wisely had a few beers so I was still in the driving seat and had quite a job on my hands to get back in time. I felt sorry for my companion as the return trip required 80mph rather than the wind-friendly 50mph and he was being blown to hell. He did his best with the TomTom but it was virtually useless as he could hardly focus on it and I could neither see the display nor hear any instructions. I reckoned we'd be OK and might even spot a sign off the A5 for our destination. 10 miles or so up the M1 and another few on the M69 were crazy. I wound up the speedo to just under the ton and conversation was impossible. We just hung on to our clothes and anything else that might have been blasted out of the vehicle. We could really have done with those sides back in place. Finally, heading along the road where we were convinced the Centre should be and we see the white Caterham they'd parked outside driving in. Phew, someone's still there and we'd made it in time! Getting into my own car a few minutes later was a really weird experience. I could feel nothing with either my hands or feet. I couldn't hear the engine or feel the clutch biting or accelerator revving. I just had to rely on the dials and hope for the best. The steering wheel felt massive but it was such a relief to be out of the wind and be warm and in comfort again, with music to listen to! Even by the time we arrived back in the village I couldn't feel much with my feet and I was completely exhausted. It had been, though, a cool time and a day to remember. Adrian, as ever, was great company and never complained once about my driving or the blast. Everyone who had wanted a trip got one, I hope, and we had some super nibbles and a fun time to boot.